Rudolf Platte debuted at the Freilichtbühne Düsseldorf in 1925. After engagements in other cities Viktor Barnowsky engaged him in Berlin in 1927. In 1929 he made his first movie, "Revolte im Erziehungshaus". In 1934 he was in "Schützenkönig wird der Felix". In 1935 he was a member of the forbidden cabaret "Die Katakombe". From 1940 to 1944 he was the manager of the Theater in der Behrendstraße and after the war he managed the Theater am Schiffbauerdamm until 1947. After 1949 he had further movie parts and during the 1960s he was in television productions. He had his last part in Fassbinder's "Die Sehnsucht der Veronika Voß" (1981). Platte was married to Vally Hagar and in 1942 for a short time to Georgia Lind. From 1942 to 1953 he was married to Marina Ried, but in 1953 he married Lind again and they stayed together until she died in 1984. Platte died only eight days later. 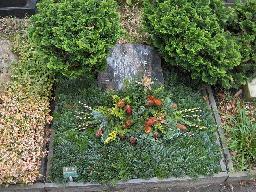 The grave of Rudolf Platte and Georgia Lind at the Städtischer Friedhof Wilmersdorf, Berlin.